by a 120 °C (250 °F) maximum temperature and a 40 °C (100 °F) thermal shock resistance. is therefore ideal for light-sensitive compounds. opaque, robust enough to be virtually unbreakable, at the same time slightly flexible. temperature of 110 °C (230 °F) continuously and 120 °C (250 °F) for short periods. properties, the bottles of this material are breakable. 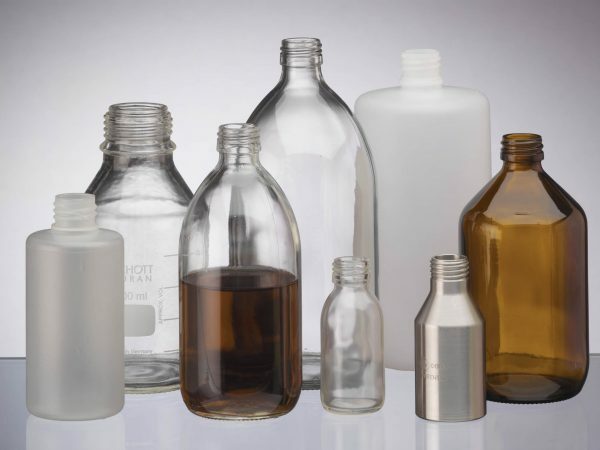 Glass bottles can be coated with plastic material to provide a safety feature against breakage. In case the container is dropped, the coating makes it less likely for the bottle to break. plastic coating. The temperature resistance gives a maximum temperature of 70°C (160°F). Note: TCB is Teflon coated butyl rubber and TCS is Teflon coated silicone.